Take a journey into the enchanted world of magic beans and moonlit nights, towering giants and handsome princes, and fates sealed (and unsealed). Familiar storybook figures such as Cinderella, Little Red Riding Hood, Jack (with his beanstalk), and Rapunzel cross paths with the childless Baker and The Baker’s Wife on their quest to reverse the Witch’s curse on their fruitless family tree. But as the characters descend deeper into the forest, they find that getting what you wish for doesn’t always end happily ever after. 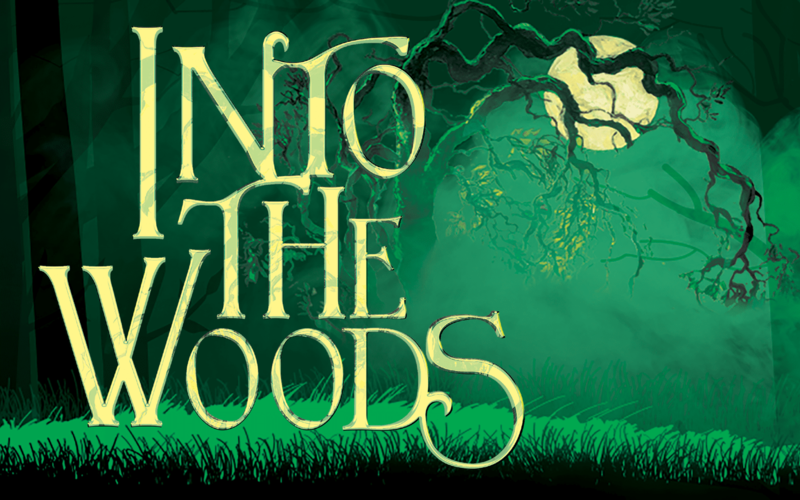 Stephen Sondheim’s witty, powerful score and James Lapine’s imaginative, darkly humorous book combine to make the Tony Award-winning Into The Woods a favorite among musical lovers and a timeless masterpiece. Eric Michael is so glad to be back at Broadway Rose doing one of his favorite musicals, and grateful to be able to do it with this amazing team. Broadway Rose credits include Joseph in Joseph and the Amazing Technicolor Dreamcoat and music director for Cats and The Drowsy Chaperone. Other area credits include music director and actor in A Christmas Carol at Portland Playhouse, and conductor of Fun Home at Portland Center Stage. Austin is an actor, singer, puppeteer, and candlestick maker (not in that order). Recent work includes Shakespeare in Love at the Oregon Shakespeare Festival as well as work with the Fertile Ground Festival, Oregon Fringe Festival, and Puppeteers For Fears. He holds a B.F.A. from Southern Oregon University. Follow him on Instagram @austincomfort. Hannah is grateful for the opportunity to play Little Red Riding Hood in her Broadway Rose debut! Her past performances include Mary Magdalene in Stumptown Stages' production of Jesus Christ Superstar, Wednesday Addams in Newberg High School’s production of The Addams Family, The Cat from Honk! the Musical, Sour Kangaroo in Seussical the Musical, and Antonio in The Tempest. A Portland native, Tyler is thrilled to be back at Broadway Rose! Regionally, Tyler has been seen as Papa Ge in Once On This Island at Coeur d'Alene Summer Theatre, Lonnie in Locomotion at Oregon Children’s Theatre, Angel in Rent, and Fulana de Tal in Boomcracklefly at Milagro Theatre. Off-Broadway: Asher in The Marks You Leave at The Cell Theatre, Songs at The New World at New World Stages. New York: Balloon Boy: The Musical (New York Musical Festival) and debuted at Feinstein’s/54 Below. His play, The Marks You Leave, produced in part with Ronnie Lacroute, premiered at the International New York Fringe Festival. Tyler attended Marymount Manhattan College and is a proud alumnus of Third Rail Repertory Theatre’s mentorship company. His first solo cabaret, Little Dark Star, will premiere later this summer. Josie is so excited to return to the Broadway Rose stage. You may have previously seen her in The Drowsy Chaperone as Trix the Aviatrix and in the ensemble of Hairspray. Some of her other favorite roles include Viney in Artists Repertory Theatre’s The Miracle Worker, and Dido in An Octaroon. She also appeared in Portland Actors Ensemble’s production of Antony and Cleopatra as the Soothsayer and as OG in Third Rail Repertory’s Men On Boats, and was a member of the Drammy Award-winning ensemble of Brother Sister Plays with Portland Playhouse. Concert credits include the Billie Holiday tribute concert held at the Alberta Rose Theatre and Portland Sings at Artist’s Repertory Theatre. Kelly is always blessed to be back with her Broadway Rose family – this time playing opposite her real-life prince, Adam! She was on this stage ten minutes ago in A Grand Night For Singing and was previously a Hot Box Girl in Guys and Dolls and starred in Gypsy as Louise (Portland Area Musical Theatre Award for Outstanding Female Actor). Kelly was recently seen in Pippin (Catherine), Cabaret (Sally Bowles), Godspell (Drammy Award, Best Ensemble), and 1776 (Martha Jefferson) at Lakewood Theatre Company. Other local credits: Marian in The Music Man at Clackamas Repertory Theatre, Northwest Children’s Theater, Stumptown Stages, and Fertile Ground Festival. Up next, Kelly will play Nellie Forbush in South Pacific with Clackamas Repertory. Kayla is proud to be returning for her third show with Broadway Rose! She has several professional credits including Magenta in The Rocky Horror Show and Mary Kate Olsen is in Love at Studio Theatre in Washington DC, Brenda in Smokey Joe’s Café at Stumptown Stages, Anita in West Side Story at Broadway Rose, Claire in Forever Dusty at triangle productions! and Beehive at Broadway Rose. She has several film and television credits including Portlandia, Grimm, Outlaw, and the film I Don’t Feel At Home In This World Anymore. Kayla is the vocalist for the Bay Area band Dress the Dead and the internationally touring doom metal band Witch Mountain. Eilzabeth is thrilled to be making her Broadway Rose debut in one of her favorite musicals, acting alongside some of her favorite people, directed by even more of her favorite people. She has been involved in theatre most recently mainly behind the scenes, following the birth of her son seven years ago, and has done sound designs for CoHo Theatre, Theatre Vertigo, and Post5; choreographed and directed for Anonymous Theatre, and serves as a company member for Anonymous Theatre. Prior to motherhood she appeared onstage at Lakewood Theatre Company, Northwest Classical Theatre Company, Northwest Children’s Theater, Theatre Vertigo, Stark Raving Theatre, and more. Katherine comes to Broadway Rose by way of Phoenix, Arizona, and is thrilled to be making her debut here in Oregon with one of her most beloved shows. Prior to this Sondheim classic Katherine has portrayed Amalia Balish in She Loves Me at Don Bluth Front Row Theatre, Anna Leonowens in The King and I at Greasepaint Youtheatre, as well as The Lady of the Lake in Spamalot at Desert Stages Theatre. Bruce most recently played Feldzieg in The Drowsy Chaperone at Broadway Rose. Portland credits include Ripper (John Pizer/Willy) at Broadway Rose, The Secret Garden (Archibald) at Lakewood Theatre Company, Death of a Salesman (Biff) at Artist Repertory Theatre, Eating Raoul at Live On Stage, Sweeney Todd at Portland Center Stage, Camelot (Lancelot) with the Oregon Symphony, and Kiss Me, Kate (Fred Graham/Petruchio) at the Musical Theatre Company. National credits include Hello, Dolly! with Carol Channing (First National Tour, Broadway), Forever Plaid (Smudge) off-Broadway, Detroit, Atlantic City, Boston, Chicago, Las Vegas and Johannesburg, South Africa; Forbidden Broadway (National Tour, off-Broadway), Opal (Narrator) at the Lambs Theatre, off-Broadway (Outer Critic Award); and Les Misérables (Second National Tour). He studied for his M.F.A. at the University of Mississippi and received a B.S. in history from Corban University. Alec is honored to be making his Broadway Rose debut! A 2016 graduate of Pacific University, Alec’s select acting credits include the world-premiere of The Legend of Rock, Paper, Scissors! (The Announcer) at Oregon Children’s Theatre), Mary Poppins (Bert) at Northwest Children’s Theatre, and Cabaret (Clifford Bradshaw) at Fuse Theatre Ensemble. Other credits include productions with Lakewood Theatre Company, Anonymous Theatre Company, Corrib Theatre, and Stumptown Stages, among others. Appropriately, he also recently made his television debut on IFC in the Documentary Now! Sondheim-parody episode, “Original Cast Album: Co-Op.” Alec is also a graphic artist and has developed artwork and branding for companies both locally and regionally, including Bag&Baggage Productions, Aloha Theatre, and the OUTwright Theatre Festival, among others. He was the recipient of a Spotlight Award at the 2018 Portland Drammy Awards for his work in media and marketing.